Last month I showed the striking differences between how Human Rights Watch treated Saudi and Israeli airstrikes that kill civilians. Here is another example of the differences between the wording of a recent HRW report on a Saudi airstrike in Yemen versus a similar report from last Just about an Israeli airstrike in Gaza. Note how HRW is bending over backwards to not directly accuse the Saudis of doing anything illegal, only suggesting that there might be problems and asking for an impartial investigation, while noting that the Houthis are placing military targets near civilian structures. As opposed to Israel where they immediately accuse the IDF of violating the laws of war, purposeful targeting of civilians for no reason, and including sarcasm about Israel’s “precision” strikes. Airstrikes by the Saudi Arabia-led coalition that hit a dairy factory in Yemen on March 31, 2015,killed at least 31 civilians and wounded another 11. The governments that participated in the attacks should investigate the airstrikes, which may have been indiscriminate or disproportionate, in violation of the laws of war. Forces of Ansar Allah, known as the Houthis, and other opposition forces, also appeared to put civilians at unnecessary risk. Area residents told Human Rights Watch that the Yemany Dairy and Beverage factory, a multi-building compound 7 kilometers outside the Red Sea port of Hodaida, was about 100 meters from a military air base controlled by Houthi forces. Military units loyal to former President Ali Abdullah Saleh were at another nearby military camp. Notice how HRW took far less time to “investigate” Israeli actions and declare them guilty than they spent to tell us that they don’t quite know what happened in Yemen. The dead Yemenis are not even worth naming in HRW’s dispatch, but HRW went into details of the lives of the victims of Israeli airstrikes, humanizing them. Too bad that HRW couldn’t figure out that the Qanan brothers were terrorists. 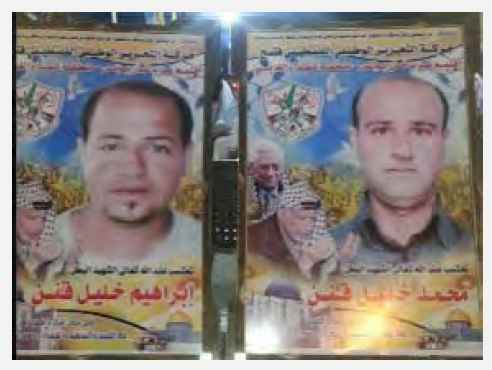 As the Meir Amit Center documents, they were both members of the Fatah Abu Rish Brigades. But HRW said, flatly, that these soccer-loving terrorists were civilians. And HRW used that as a reason to accuse Israel of war crimes. Once again, HRW’s bias against Israel is unmistakable.